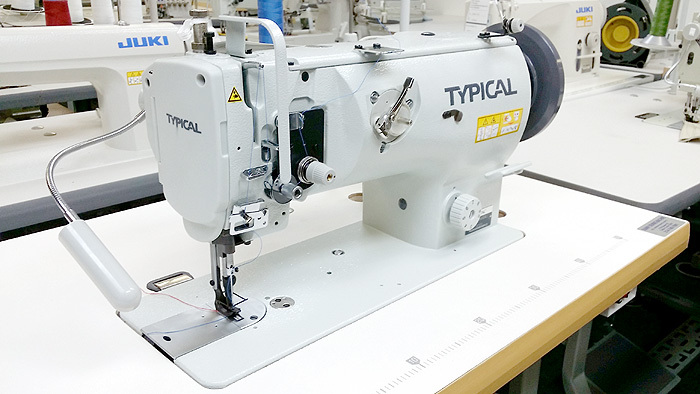 The TYPICAL GC0605 is a Single Needle Walking Foot sewing machine designed to sew leather, upholstery fabrics, canvas and other heavy weight materials. Large shuttle hook and powerful mechanics allow you to sew with thread sizes up to Tex 270 with beautiful stitch aesthetics and smooth feeding. This machine also features automatic lubrication system, a large horizontal automatically oiled hook, built in bobbin winder, high presser foot lift of 16mm, and a safety clutch that prevents it from being forced out of timing. This is a very high quality machine at an outstanding price. Thread Sizes: Bonded Nylon Tex 69 to 138 most recommended, Tex 270 max. BTW, this is the only machine in its class that will comfortably sew with 270 size thread. Absolutely amazing mechanics and sewing action!! !